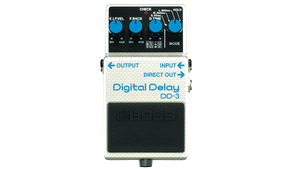 KitMonsters – Boss Digital Delay DD-3. The music makers’ guide to making music. Offering high-quality digital delay effects, this pedal can offer delay times between 12.5ms to 800ms. This is best used for short delays, and the variety of modes allows different echo and feedback effects. The hold function also allows for some interesting and creative sounds. Longer and stranger effects are best found with the other delay pedals, such as the DD-6 or DD-7.